*Includes 4 different reading levels, plus a wordless version* This book honors all that mothers do. Children are encouraged to draw comparisons between the animal mothers in the book to the way their own mothers care for them. This cut-and-paste ladybug art project will provide your students with opportunities to improve their fine motor dexterity and their ability to follow directions. In this 38 page e-book we have provided the patterns for our special Mother’s Day & Father’s Day keepsake books for you to use with your students. A sweet little boy surprised his mom one morning and brought her a cup of coffee. He made it himself and he was so proud! Anxiously, he waited to hear the verdict. The mom had never tasted such bad coffee in all her life! As she forced down the last sip, his mom noticed three of his little green army guys in the bottom of the cup. Have students color small pictures for a coupon book for Mom. You should be able to get 3 or 4 coupons on one paper. Good for one free kiss. I’ll sing you a song. I’ll eat all of my vegetables. I’ll clear (or set) the table. I’ll carry the groceries in. I’ll make you breakfast in bed. I’ll take the trash out. This flower is similar to the coupon book in that the child promises to help with some chores around the house. The difference is that Mom can pull the petals off of a flower to “redeem” the flower petal coupon. I will set the table. I will dust the house. I will make my bed. I will pick up my toys. I will take out the trash. Add a stem and leaves to make the flower. Here’s a gift for Mother’s Day. I’ll try my best in every way. Relax and soak! Don’t you agree? Place Epsom salts in a glass or metal container. Combine glycerin and food coloring. Add perfume to make a fragrant mixture. Then add to Epsom salts. Stir thoroughly. Use paint markers to make a picture on a flowerpot. You could also have children dip a finger into red paint and decorate the pots with ladybugs. Either plant a flower in the pot or include a packet of seeds for mom to grow at home. Tie a ribbon around the pot and attach this poem to the potted plant. I’m your little flower, Mom. Too much will make me wither. With enough, I’ll bloom again. I am your little flower, Mom. Here’s another poem. You can change the name of the flower to match what you planted. This flower is for you, Mom. It’s a pansy, you see. It’s growing more and more each day. It’s really just like me! With a note that’s oh so true. Here is a poem to attach if you plant seeds and they don’t come up in time for Mother’s Day. I planted some seeds in hopes that they’d grow. Something went wrong. I just didn’t know. Instead of some flowers, it’s a cupful of dirt. I love you! I hope your feelings aren’t hurt! Shouldn’t be all that hard. And grow all over the yard. Because they’re just for you. Will always be there to stay. “You” stand out from all the rest! Hope your Mother’s Day is fun. From your “darling little one”. 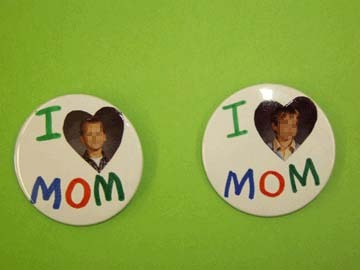 If your school has a badge-making machine, you can create a badge for every Mom. Trace around a heart sticker and cut a school photo into a heart shape. After cutting out the round white paper for the badge, write the words and glue on the photo to make the badge, which is covered with a clear cellophane sheet. A dotted or colored background circle looks nice also. I’ve seen some of my former Moms wearing these pins 10 years later! Decorate a bag with wall paper to look like a bed and Mom’s head. IN the bag we will put a napkin, a breakfast bar and a tea bag. This idea came from a posting on Kinderkorner webring. Donna from New Hampshire wrote the following poem to go with the Breakfast in Bed projects. Thanks for your creativity! But it’s breakfast in a bag! I’ve been making the cookbooks every Mother’s Day for more than 10 years. I begin by asking each child to tell me something their Mom makes that is one of their favorites. Sometimes you have to practically drag the answers out of them by asking some of these questions. “Where does she get ____? How long does she cook it? How long does it take to make it? What do you think the oven temperature is set at? What does she put in it? What else does she put in it? How much of that does she use in it? How does it taste? ” You get the idea! I include the pages below at the beginning, then copy each child’s recipe and bind them into a class Mother’s Day Cookbook for each Mom. They love them! This is the next page of the cookbook. A friend gave me this recipe and I adapted it for my class. Last year I took each child’s photo dressed in a chef’s hat and apron, holding a bowl and spoon. I use a graphic near the title. I like to include an “About the Author” section and I ask each child to tell me why his/her Mom is special. These are so great! Thanks for sharing! I usually have kids write a book about their mom. This year I’m adding a “Things I’ve Learned from my mom” section. I’m also going to try the kid photo bookmarks for gift tags from pinterest, and possibly the Breakfast in Bed craft you shared. I love all the poems!